January Storms - At Southend airport, a light aircraft was bodily lifted from the tarmac and thrown onto an adjacent railway line, where it burst into flames and blocked the railway services into London. Fire Engulfs Southend Pier - Fire has destroyed the famous pierhead at the end of the world's longest pier, in Southend on the UK's south-east coast. A hundred people used boats and the train which runs the length of the mile-and-a-quarter (2,145m) structure to escape. Strong south-westerly winds fanned the flames, watched by thousands of holiday-makers on beaches on both sides of the Thames estuary this evening. 1976 was not a good year for the pier, no sooner than it started to recover from the first fire a second started at the shore end, engulfing the bowling alley, as shown in the image above. 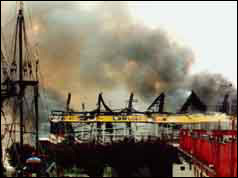 A repreat fire in 1995 at the shore-end would see the bowling alley finally destroyed completely. Pier Hill on Fire - The buildings propping up pier hill were struck by fire, the units some derelict and others used as storage had been a concern of the council for a while who had warned about the risk of fire, not least if the fire became too intense this could cause serious infrastructure damage that could put pier hill itself at risk. These Victorian buildings which sit just west of the pier entrance, as historis as they are this fire would lead to there eventual demolition. Ring Road Idea Never to be Mentioned Again - The council finally this year decided to close the book on Southend's very own Ring Road. Originally conceived in the 60's to help with the central traffic problems. The eastern stretch being built would continue, but the southern and western sections were proving too difficult and costly to achieve, so for the last time the council asked for the Ring Road to be never mentioned again. Southend Music Festival - The growing national trend to use football stadia for music festivals spread to Southend on May 31st, when Roots Hall took on the Southend Music Festival, hosted by respected Radio 1 DJ John Peel, the menu for the day would include such acts as Budgie, Fairport Convention, Alvin Lee and the American David Bromberg Band, as well as the farewell performance of Southend's own Mickey Jupp Band. some 3,000 music fans enjoyed the event. Hole in the Ground - The work continued in 1976 as the Queensway Underpass was built. Curiously becoming known as the 'Hole in the Ground' as the community kept close scrutiny as it seemed to be getting deeper and wider. Cup Fever - Southend United's season became a bit better in January when they beat Brighton 2-0 to take them into the 4th round of the FA Cup. Next came 3rd Division rivals Cardiff who were brushed away 2-0, at last into the fifth round against some significant opposition in the shape of Derby County, drawn away at the Baseball Ground. This game would prove to be a game too far, as the Shrimpers lost 1-0. A shame as the next round would have drawn them against the mighty Manchester United, who went onto the final to play eventual 1-0 winners Southampton. The Millers Take Over Peter Pan's Playground - Below the pier entrance has existed gardens, boating lakes and amusements for some 50 years. In 1975 the operators went into liquidation due to the alround slump in trade in British seaside towns. The council had received and rejecting planning permission to turn the area into an outdoor market, just as well as David Miller stepped and at huge risk purchased the funfair and reopened it in 1976. The new team in charge would truly be a family affair with wife June, son's Philip and Paul as well as daughter-in-law Margaret all needing to put in 7 day weeks to make sure the new venture could succeed. Whisky Mac Wins - The top TV talent show on Saturday night was New Faces hosted by Derek Hobson, which produced stars such as Marti Caine and Lenny Henry. The show was keenly watched for some of the 'Mr Nasty' comments that would be aimed at the contestants. However, on 20th March Southend provided a group called Whisky Mac who became a resounding success on the show and winning outright. Regiment Receives Royal Visit - Prince Philip flew his Queen's Flight red helicopter to Horseshoe Barracks in March to do a home visit of his regiment the 1st Battalion of the Duke of Edinbrugh's Royal Regiment. Regiment Beats the Retreat - Horseshoe Barracks in Shoeburyness became a true military spectacle as the 1st Battalion of the Duke of Edinbrugh's Royal Regiment in June, beat the retreat. The musical parade was significant as some 600 troops were deployed Warminster much to the angst of the local community that depended on the regular income. The unit would finally leave in September with no replacement likely. Today from the Streetview, you can tour the barracks as they look today.